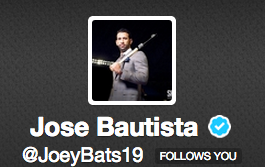 Much like his swing mechanics, Jose Bautista’s twitter account is controlled by his hitting coach. Jose Bautista is participating in Random Acts of Kindness by following random baseball blogs across the internet in an attempt to raise his popularity amongst bloggers. He thought he was invited to an actual Cespedes Family Barbecue; the craziest Cuban party of the year. As someone who has walked 214 times over the last three seasons (third most in baseball), Jose is equally amused at Jeff Keppinger doing what he’s doing. So if by any chance you actually read this, Jose Bautista, we thank you and appreciate that you took the time out of your busy schedule to fit in two blonde teenage dumbshits with no semblance of baseball knowledge. It means a lot. This entry was posted in Randomness, Uncategorized and tagged blue jays, follower, following, joeybats19, jose bautista, random, twitter. ← Happy 32nd Birthday Justin Morneau ! He followed me earlier today and I couldn’t believe, I’m 13 years old and a famous baseball player follows me!